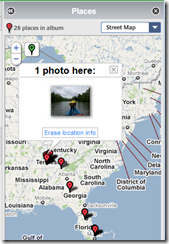 Automatically Geotag Pictures with Droid – Learn Picasa and Google Photos! First, just what is geotagging? It’s attaching the lattitude and longitude coordinates to a picture, a .jpg file, so it can be placed on a map in the location where it was taken. When a photo is geotagged, these coordinates are part of the ‘metadata’ embedded in the file itself, just like the date and time where it was taken. 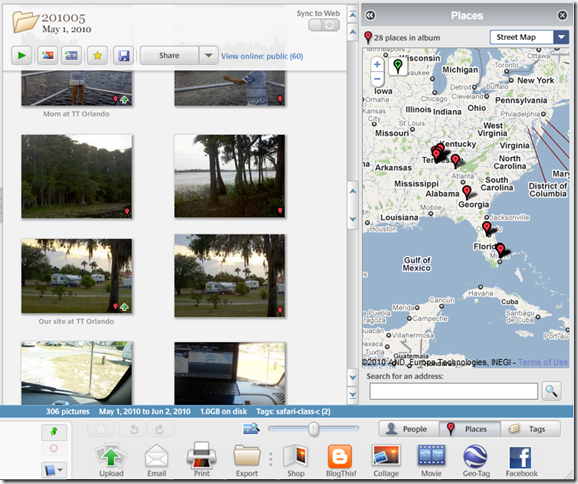 In the screenshot of Picasa below, you can tell which pictures have been geotagged by the little red balloon icon in the lower right of the picture. If you open up the ‘Places’ pane, you will see the markers on the map. Click on a marker, and you’ll see the picture. We all take for granted that the date and time of a photo is stored with the photo. Someday (soon) we will also take for granted that the place of a photo is also automatically stored with the picture. In previous articles I’ve written about how you can manually geotag a photo. They’ve, made it pretty easy, but it’s still something that takes a bit of time and thought. For me, I’m just too lazy to make the effort. But, if it can be done automatically, now that’s a different story! I’d love to be able to see all my travel pictures pinned to the spot on the map where they were taken. And, now I can as long as I take the picture with my Droid cell phone. I have the Motorola Droid cellphone from Verizon. Other devices have this capability, but Droid is what I know. You see, in addition to being a phone, and a camera, the Droid is also a GPS receiver. It knows exactly where it is, so it can stamp the pictures taken with that information if you turn the setting on. I’ve even been known to snap a photo at a location when I’m not really taking it for the picture, I’m just taking it for the location. I can later use that picture on the map to navigate back to the same spot. The Droid isn’t the only device that will auto-geotag photos. Other cell phone/cameras have a similar capability and you can also buy SD cards to Geotag. If you use any of these methods, please leave a comment and tell us about it. I have had an iPhone 3Gs for about a year and it geotags photos. Just make sure “Location Services” is turned on. On the home screen tap “Settings” then tap “General” and turn on Location Services. When on a trip, I take photos with the iPhone to register the location and then import photos into Picasa. I only keep photos taken by the iPhone in the “Camera Roll”. Import sometimes fails if some other pictures are saved from email, multimedia messaging, etc. Places show very nicely. To tag the pictures from my regular camera I write down the location registered by iPhone (copy and past doesn’t seem to work) photo and then open pictures taken with my regular camera so that I can manually label that photo. I type the coordinates into the little google map and then put the upside down teardrop into the correct place. Tools to do things with geotags in Picasa are not great. It would be nice if Picasa let us batch label locations for all the photos in a folder. 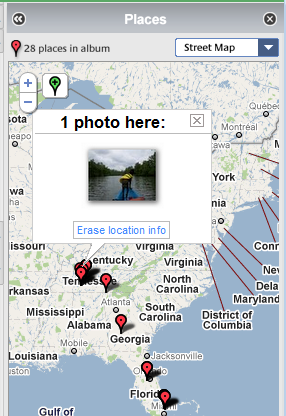 Also, is there a way to search all photos by location in Picasa using the search window? Also, I have an “App” called “Simple GPS” that shows iPhone location including altitude without using the camera. You can email the coordinates. The App costs $1.99. By the way, the 3gs take pictures the old fashioned way, like with a pin-hole camera. Pretty basic in my humble opinion. With lots of light, a steady hand and distant objects you can make a somewhat OK picture. I almost bought a geotagging device for this summers’ touring. what appeals is the automatically software matching up GPS coordinates with photo time-stamps. What does not appeal is power limitations. If the five devices I considered battery life was 8 to 15 hours. For me that means new batteries every day. No way! The device I almost bought, GlobalSat DG-100, offered a usb charge but that meant having the laptop powered up for seven hours. As it stands now I may take a photo of my gps to have the coordinates of where a shot was taken. I need memory joggers a lot these days. What we did buy is the Palm Pre that gives provides an internet hub for free. And no, it does not have a gps built in.